This pretty house with two bedrooms and two bathrooms is in a gated community of 14 houses on San Andres Golf in the middle of the Campano golf course. There are pretty communal gardens and a shared pool [8m x 5m]. Downstairs off the entrance hall is the cloakroom, the kitchen and spacious lounge dining room with porch and views of the golf course. Upstairs are two bedrooms. The master bedroom has an ensuite bathroom and a terrace with views of the golf course. The second bedroom has a terrace with views of the shared gardens. There is a shower bathroom next to the seond bedroom. There is a roof terrace with distant panoramic views and a private garden with porch overlooking the Campano golf course. The front patio looks onto the shared gardens. The private garden is 5m x 3m. There is internet TV. WiFi and gas central heating. "Vista Golf" is licensed for short term rentals. Licence No : VTAR/CA/00661. 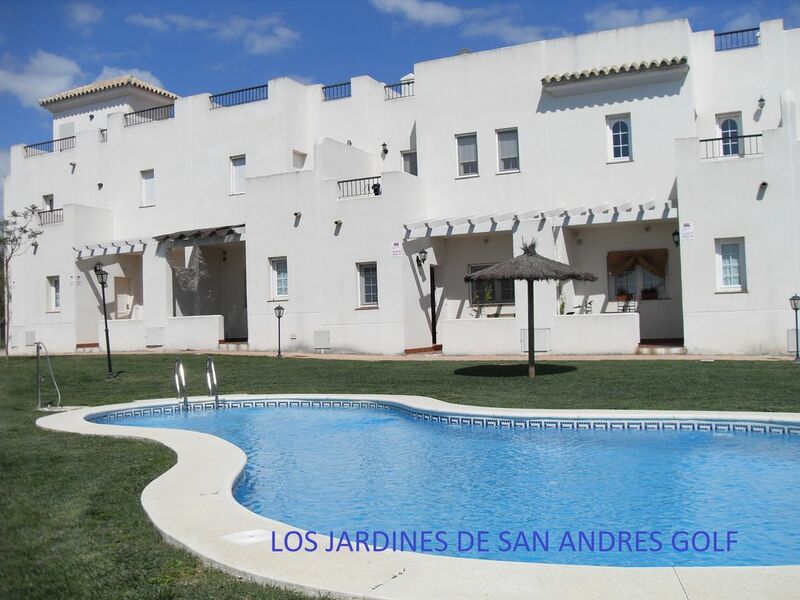 Los Jardines is a small gated community of 14 houses on San Andres Golf with pretty communal gardens and an 8m x 4m pool. All the houses have private back gardens [3m x 5m] with bbq, a back porch overlookiĝng the golf course, two or three bedrooms, wifi, internet and satellite TV and gas central heating. On the ground floor is a spacious lounge dining room, kitchen overlooking the communal gardens and guest cloakroom. On the first floor are the bedrooms: the master bedroom has a full ensuite bathroom with terrace overlooking the golf course and the second bedroom which has a west facing terrace has an adjoining shower bathroom. San Andres Golf is an urbanisation on the beautiful 18 hole Campano golf course just 7 minutes by car from the fabulous beaches of Roche extending to Barrosa; the nearest pat of the beach is at Lomo de Sancti Petri. We have produced a video of the house, San Andres Golf, Conil and Cadiz to give a better idea of the beauty and variety of this area which is a pleasure to visit at any time of the year offering good restaurants, interesting monuments, bird and wildlife,beaches, sierras and a coastal plain with numerous golf courses and a wide range of sports facilities and sunshine and good weather. What a pleasant and relaxing holiday we had there ! The description of the house is accurate and we were very satisfied of all the facilites and the beauty of the house. We were very well welcomed and surprised when we entered the house first. It was cleaned and well furnished (sheets and towels are provided and changed every week). Also the house looks smaller on the pictures, we didn't expect such a big house. We were 4 young adults with a baby and the 2 spacious bedrooms were largely sufficient for us. There are plenty of activities to do there but a car is essential. The owner will give you a full description of all the activities and sightseeing. The booking was also very fast and done professionnaly. Overall I would recommend this property to anyone who is looking for a relaxing place, close to everything (there is a supermarket, petrol station, beckery, buchery, etc at 5 mins by car). I'm absolutely delighted you had such a good holiday and thank you for taking the time to submit a review. Hopefully you would like to visit the area again - you would always be welcome at our house on San Andres Golf.. It was just a perfect holiday. The house was clean with a lot of space for us (2 persons). Kitchen well equipped, nice terrace with a small garden on the ground floor for having breakfast or dinner and a big terrace on the first floor for having coffee in the late afternoon. Internet was working reliable so we were well connected. Swimming pool was clean so we could enjoy in in the evenings when we came back from our trips. There are multiple interesting places around to visit. Conil is very near. Also Cadiz, Vejer or Jerez. I can recommend this accommodation, there was nothing to complain about even if I am very picky. I felt very comfortable there and I would book it again. Very many thanks. You would be very welcome. The house was everything we had been expecting. We were greeted on arrival at a nearby bar and taken to the house as it could have been a bit tricky to find on our own but once shown we were okay. Everything was clean and well maintained, we even had beach towels provided which was very useful. There was plenty of room for the 4 of us both within the house and outside. You do need a car as the beaches and restaurants are all a drive away. La Barossa beach (the nearest) ia absolutely beautiful and also has very good & clean facilities! There are plenty of good restaurants around the area, we never had a bad meal all week. The golf course is very handy and the boys said it was a good course. I would definitely recommend this property, especially if you want a nic, quiet & relaxing holiday!! This accomodation provided an excellent base from which to explore the surrounding area. It is well appointed with good kitchen facilities, good bedrooms and bathrooms and a very comfortable lounge diner. It was always good to come back from a days sightseeing and relax on either the down stairs terrace or upstairs balcony. The views over the golf course (really more of an olive grove) made it feel very pleasant. When we stayed (Easter), the surrounding area was quiet.A car is essential in order to get to the nearest shops, restaurants and beaches. I have no hesitation in recommending this property. Nosotros alquilamos Vista Golf, es tal como muestran las fotos, es muy comoda, tiene todos los detalles para que la estancia sea comfortable. Muy limpia, vajilla, sabanas y toallas bonitas y nuevas. Muchas gracias por sus palabras amables. Muy contentido que has disfrutada tanto de nuestra casa. A la proxima vez.